I spent Saturday at Long Beach Comic and Horror Con, which despite its name is still, five years on, one of the most comics-focused “comic con” events I’ve been to. 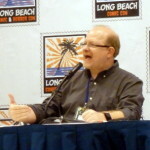 Among other things, I caught the Young Justice Voice Acting panel with a dozen cast members and Greg Weisman, a discussion panel between Marv Wolfman and Scott Lobdell and a spotlight on Mark Waid (see photo). Wolfman and Waid are always fascinating, and Lobdell turned out to be really interesting as well. Brian Buccellato was supposed to be there as well, but I never saw him. Artist’s Alley was huge, though, and I never quite managed to do the full systematic pass that I intended, so it’s entirely possible that all my trips through the area missed him. Jason Spisak, when asked about getting into his character, remarked that Wally West’s lines in the script always look like he’s a “total douche,” but what he had to do was think: His friends keep him around. There’s got to be something endearing to him that they want to have around. He’d find that and make it come through in his acting. Speaking of Young Justice, the game studio that did Young Justice: Legacy still has the license. If the game does well enough, they’d like to do a sequel…set during what would have been season three. Mark Waid, when asked what story felt like he’d finally made it, said “The Return of Barry Allen.” That’s interesting, since the story was about Wally West reaching the point where he felt like he’d finally made it. He also said that his record at making good cliffhangers is due to the fact that he writes them before figuring out how the character’s going to get out (which makes for a few stressful days at the beginning of the next script). If he doesn’t know how, the audience isn’t going to guess! Scott Lobdell compares the New 52 Kid Flash’s personality to Woody Woodpecker. Check out my full write-up at K-Squared Ramblings or go straight to the photos. This entry was posted in Fandom and tagged Cons, LBCC, LBCHC 2013, Long Beach, Mark Waid, Marv Wolfman, Scott Lobdell on November 25, 2013 by Kelson. Still, I hope they find a way to move back to the Bay Area soon. I attended three years at the Moscone Center when it meant traveling (it probably helps that I have family and friends in the area to visit on the way up and back), and while the show still feels very much like part of the same family, it does feel like a slightly different show. I was in San Francisco on a business trip last week, and when I realized I was in the neighborhood, I just had to stop by Yerba Buena park and the Moscone Center for old time’s sake. 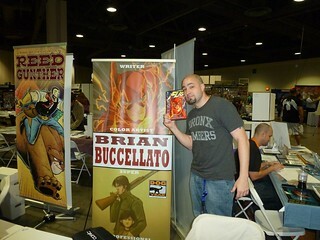 Coming up sooner, though, is Long Beach Comic and Horror Con, next weekend (November 23-24). 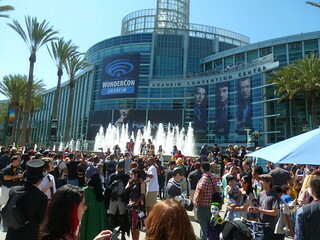 This will be the fifth year of the convention, which was started to fill the gap left when Wizard World canceled their Los Angeles convention in 2009, and I’ve been kicking myself over not buying the lifetime membership they offered in year two. It’s a great local convention, and it’s very focused on comics. To give you an idea how focused, the main floor is built around Artist’s Alley as its main feature. I’ll definitely be attending Long Beach this year, and plan on posting photos to my Flickr stream and Speed Force’s Instagram feed. It doesn’t help that ComiKaze’s promotion is off-putting, the way they puff up their own importance and act as if other local cons like LBCC (and for that matter WonderCon) don’t exist. In good traffic, the Long Beach, Los Angeles and Anaheim convention centers are less than half an hour from each other. People here spend more time than that commuting to work. This entry was posted in Fandom, Timely and tagged Comikaze, Cons, Cross-Post, LBCC, LBCHC 2013, Long Beach, WonderCon, WonderCon 2014 on November 12, 2013 by Kelson.